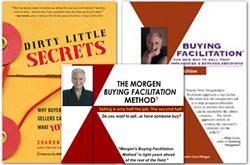 Bundle: Buying Facilitation®, Buying Facilitation® Booklet, Dirty Little Secrets. Dirty Little Secrets: Why buyers can't buy and sellers can't sell and what you can do about it. A book on how to hear others without bias, assumptions, or misinterpretations.